Vampires versus werewolves in centuries-old war is the premise of Underworld, a new horror/action movie that takes its inspiration from The Matrix. It sounds a lot like White Wolf's Vampire: The Masquerade and Werewolf: The Apocalypse, but is safe for people who want nothing to do with role-playing games. The fact of the matter is, Underworld is a brainless, violent romp through the streets of some unnamed city. There is enough thought behind it to actually give it a premise, but it takes itself so seriously that it becomes laughable as it moves towards its finale. The main character is Selene (Kate Beckinsale, Laurel Canyon, Serendipity), a vampire. Not only is she a vampire, but she is also a Death Dealer. This means that it is her job to hunt and kill werewolves, and to wear tight, shiny, shiny leather. Underworld immediately thrusts viewers into the action, with Selene hunting werewolves, or as the film refers to them, "lycans," short for lycanthropes. Selene notices that they are hunting Michael (Scott Speedman, Dark Blue, Duets), a human. In this little world, humans seem to be neutral ground, so this gathers her interest. As she pursues Michael, she finds that things are not what they seem. Director Len Wiseman, who co-wrote the story with Kevin Grevioux and Danny McBride (who also cast himself in a small role - smart) slowly unfurl the world of Selene. No one is sure how the war started, but it continues. Vampires are closing in on the Lycans, but Selene doesn't agree with the ways of Kraven (Shane Brolly, Impostor, Stealing Time). He is more of the Anne Rice vampire, content to sit around drinking wine. Wiseman, Grevioux, and McBride did well to create such a complete universe. History, politics, and even class in a sense make their way into the story. 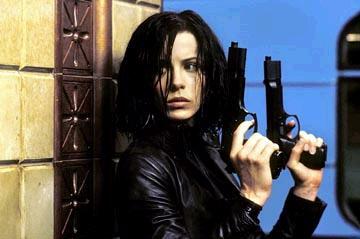 A lot of thought went into Underworld, so that it has a grasp of logic that many movies don't. Wiseman shoots everything with a blue tint, muting many of the colors so they are black or gray. It always looks dark, which complements the story. And everything does look pretty cool. And since the characters are supernatural, they climb on walls, jump off buildings, and leap through the air. It's all very stylistic, combined with lots of guns and bullets. It's also a step towards making Beckinsale an action hero. She's pretty petite, but still manages to cast an imposing figure in her skin-tight leather corset. Underworld also makes Bill Nighy (I Capture the Castle, Lawless Heart) a believable action hero, which is pretty difficult given he is over fifty years old. However, with the appearance of Nighy, Underworld begins a descent into parody. After intricately creating this little universe, Wiseman begins to take it apart with the resolution of the plot. Each plot revelation towards the end gets more ridiculous, and when coupled with the fairly exciting action sequences, Underworld turns into an unintentional comedy. 2 hours, 1 minute, Rated R for strong violence/gore and some language.